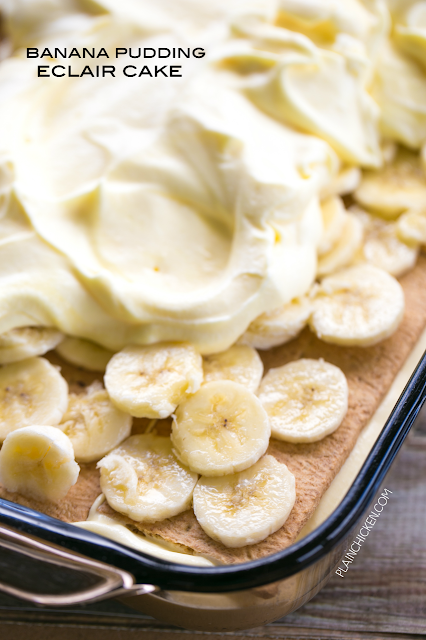 Banana Pudding Eclair Cake - I am in LOVE with this easy no-bake dessert. Great for potlucks, cookouts and Easter! Graham crackers, vanilla pudding, banana pudding, cool whip, bananas, chocolate frosting. Can make ahead and refrigerate before serving. Everyone RAVES about this yummy dessert recipe!! 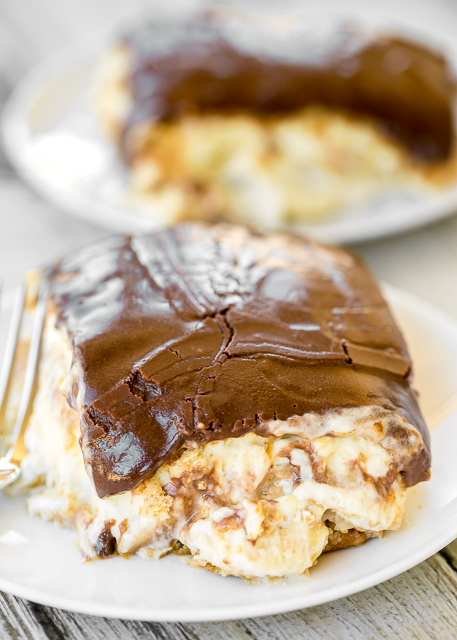 This Banana Pudding Eclair Cake deserves a spot at your Easter dinner table. This stuff is CRAZY good! The best part about the recipe? Um, it is no-bake. Boom! LOVE no-bake desserts!!! This Banana Pudding Eclair Cake can be made a day or two in advance and refrigerated until you are ready to serve it for dessert. Now, we don't like a ton of bananas in our banana pudding. I know that sounds weird, but it is just how we are. LOL! I used about 7 medium bananas for this recipe, but feel free to load it up with tons of bananas if you are a nanner lover! To bump up the banana flavor in the cake, I used one package of banana pudding. I typically use only vanilla pudding in my Banana Puddings, but I decided to get crazy to swap one box of vanilla pudding out for banana pudding. It was just the right amount of banana flavor!! Spray the bottom of a 9x13 pan with cooking spray. Line the bottom of the pan with whole graham crackers. Top graham crackers with half of banana slices. In bowl of an electric mixer, mix both pudding mixes with milk; beat at medium speed for 2 minutes. Fold in whipped topping. Pour half the pudding mixture over bananas. Place another layer of whole graham crackers on top of pudding layer. Top with remaining sliced bananas. Pour remaining half of pudding mixture over bananas and cover with another layer of graham crackers. Heat the container of prepared frosting, uncovered in the microwave for 1 minute. Pour over the top of the cake. Refrigerate for at least 12 hours before serving. mmm, could so eat a big bowl of this right now! Thanks for the new dessert idea! WHY haven't I thought to do this?! I can't wait to try this! This looks wonderful! I am not a fan of prepared frosting, but maybe I haven't tried the right one yet. Which brand do you like to use for this recipe? Thanks.